Mona Lisa's All-Seeing Eye hovers in the courtyard of the Louvre, coming to rest on the pyramid. If you are standing in the courtyard of the Louvre in Paris, viewing this page on your smartphone, follow this link to launch the artwork: http://m.layar.com/open/louvreilluminati . It is only viewable in the display of a smartphone (Android, or iPhone 4 & higher) or a tablet PC with access to the mobile phone network. On your smartphone, go to the app store and download the free Layar reality browser app. 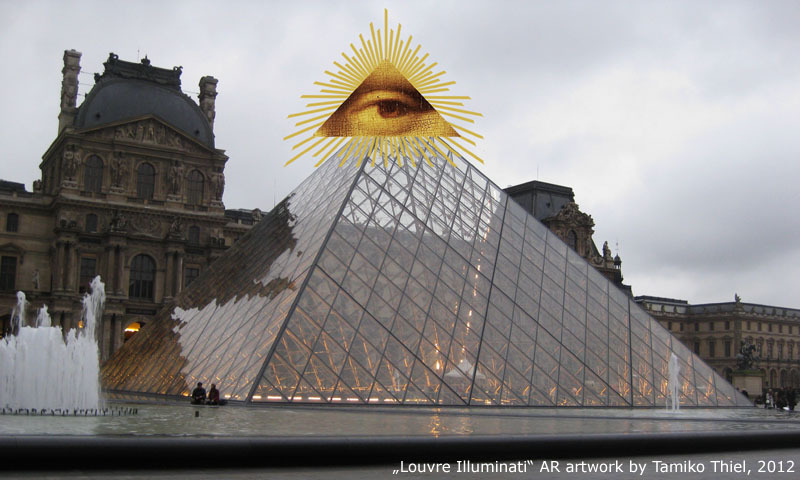 Go to the pyramid in the courtyard of the Louvre, start Layar and search for "Louvre Illuminati."